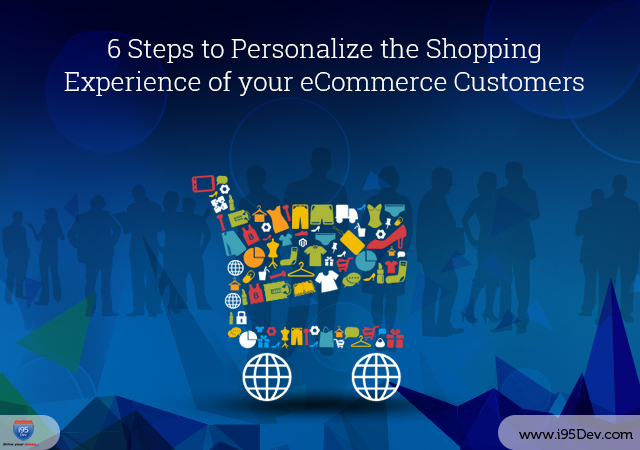 In this blog, we shall now step into details of arriving at an adequate eCommerce personalization strategy; remember that no approach is constant neither can it be arrived at overnight. Online retailers and marketers need to constantly work on a systematic approach evolving a perfect 1-on-1 personalization experience to countless visitors that come to your site. On most eCommerce sites, by default, the majority of the website visitors are considered anonymous; because of which they are all presented with the same layout and the same information. And, once they leave without purchasing, the site owners are clueless about the reasons and wonder how to get them back. Personalization tools today are very sophisticated and data & platform agonistic. They help you gain insights into the user behavior and help you maximize each interaction even for first-time visitors. There are various ways, at varying levels, in which the user experience can be customized. For starters, the user behavior can be customized based on basic information like where they come from (Geo Location, Source/ Medium, Device, etc.). Designing & leveraging landing pages with specific messages to engage visitors can be very effective. For visitors, where you have more information (say when they log into your system before purchasing) the personalization opportunities are endless. You can use their purchase history and other information to show customized messages, products, offers, cross-sell, up-sell, and more. A number of tools also use what is called Predictive personalization, where they predict the user behavior based on data available for other visitors, and then customize/ personalize the message and offerings using that. Onsite personalization will have little effect on the visitor if you do not see your message or promotion. Before anything, it is important to capture the users’ attention – you might know what they want, but if you do not get their attention, they will probably never notice that piece of promotion or content. Slide Outs – Well-synced slide-outs (layers that pop-in from the side of the screen) are a very common way to capture user attention to the dynamic messages. Pop Ups – When you do not want to leave things to chance. A nice pop-up in the center of the screen with the desired message, while the background is temporarily blocked is a sure way to capture your visitors attention. Floating Bar – At times being persistent is the only option. Having a bar or any element, always stay in the visible area of the screen moving with the customer as they scroll or navigate to other pages can be very difficult to ignore. Color and Animations – A call-to-action in color that stands out in the background is probably the most used technique to capture attention and drive users to the desired action. Animations (blinking CTA or other visual animations), work on the same principle of differentiating from the surrounding to capture attention, are also known to be very effective. What next after you have their attention? Give them a compelling offer that they find difficult to ignore. The creative and messaging plays a very important role as this is where you use all the information you have about them to drive action. They might see your offer, also find it relevant to them but if they do not take any action (if the messaging is not right) then all the effort will bear no fruit. Retargeting or remarketing presents businesses another opportunity to convert visitors who have visited your eCommerce store and left without taking any action. In retargeting, the visitor behavior is tracked using cookies and other unobtrusive code placed on the eCommerce website. After the user leaves the eCommerce store, the data stored in the cookies is used to retarget visitors through personalized ads (based on their behavior on your eCommerce store) as they browse or visit other websites. Retargeting can be very effectively used in conjunction with email, as they both act as reminders to drive customers to take an action you desire. But remember, for a campaign like this to be successful it must first resonate with the user and for that personalization is a must. Emails are the still the most effective channel to generate leads and improve conversions. Emails go beyond your eCommerce store and have the potential to target your customers when they are not on your site; always stay on top of the customer mind. Emails also present an excellent opportunity to personalize the message and target customers more effectively; businesses can better segment the target list and personalize the email content (more than just addressing your customer by name) to increase its efficacy. We will talk about email personalization in detail in our next blog on personalization but email personalization briefly includes segmentation, messaging (subject and content) and CTA. Email personalization plays an important role when you want to keep loyal customers associated with the brand, nurture leads, convert visitors who have abandoned shopping carts, and more. A/B testing strategy is very useful to evaluate and compare different messages; it requires a constant effort to arrive at what effectively works for your visitors and customers – what worked today might not work tomorrow. Set your premise and clearly assess the amount of traffic and a cutoff date that will be required to observe; use an A/B testing calculator. Do not set high standards or expect statistically significant results. Simply start with measuring simpler and basic top-of-funnel KPIs such as click-through rate [CTR], bounce rate, engagement, etc. ; these will help you understand if you are on the right track. Personalization can greatly improve the conversion rates bearing in mind the volatile and competitive market and an equally challenging audience. In our next blog on personalization, we will look at the role of content and email personalization in the same context. Stay tuned! !